Click the photos below to enlarge. Exterior width of casket: 28"
Exterior length of casket: 81"
Exterior height of casket: 23 1/4"
Superior client guidance through difficult time. I was very reluctant, and very worried about ordering a casket online. But I did it for financial reasons, and hoped for the best. The casket was absolutely beautiful!! The order process was handled professionally, and and with kindness. I was told that casket would arrive the next day, and they would call the funeral home, and give them the delivery time. And that is exactly what happened. As a matter of fact the funeral director complimented us on how beautiful the casket was, and how nice, and professional the delivery people were. Please do not hesitate to order from this company, I highly recommend them!! When I found out my husband had cancer and it would be terminal we started shopping around on line for a casket, we could not believe the price of a casket through the funeral home. We came across this website, we were a little wary of it, just because it was so important for us to receive it on time. My husband passed away on Tuesday afternoon, we called that evening around 8pm MST and placed the order. We paid to have it overnight and the funeral home received it on Thursday. Even the funeral director was impressed by the quality and beauty of the casket, as were we. Thank you so much. My aunt told me about ordering casket online when my dad passed away. We did some research and found a great looking casket for my dad from here. We followed the tips that we read from this site and everything went smoothly, and we received the casket on time. It was a pleasant experience, and they are truely working 24/7, since I ordered it on 4th July weekend! When my mother passed away the beginning of May and we went to the funeral home to purchase a casket. We could not believe how expensive the caskets were. The funeral director who is a good friend of the family said, we should try going on line and I came across your web site. 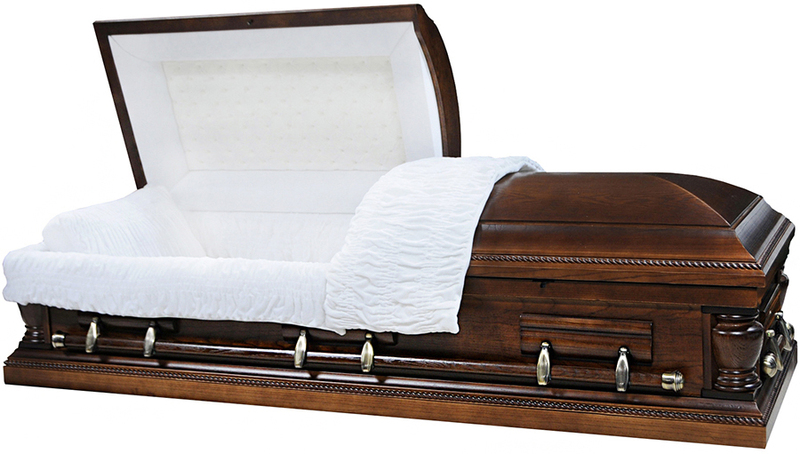 I called and purchased the 3003 Mahogany Veneer Casket from a lady at Best Price Caskets. I was shocked when the casket showed up at the funeral home exactly as promised by the next morning. The funeral director was amazed how beautiful the casket was and when I told him I paid less then $1,000.00 plus $355 shipping he said, there was no way he could of bought a casket of this quality at that price. Thank you so much Best Price for making our experience a little easier. My name is Joan Harris and I am from Canada. My Father-in-Law passed recently and my Pastor told me about a website called "Best Price Caskets", and boy did I get the "best price". Considering that I am in Canada and even with currency conversion I saved more than 60% on the cost compared to what the Funeral Home wanted to charge us. I had to pay some import tax to the Canadian Customs (13%) but The agents at "Best Price" handled our situation with complete Professionalism and I personally would recommend them to all my family and friends. My husband and I viewed the casket when it arrived today (we only ordered it yesterday afternoon) and boy were we surprised. The casket was breathtaking, the funeral representatives were all in awe - notwithstanding the fact that we paid less than half the amount they were charging us. Again, kudos to you all at "Best Price" and believe me you will have my business whenever the need arises. Congratulations on a job well done!! When my mother passed away the beginning of May we went to the funeral home to purchase a casket. We could not believe how expensive the caskets were. The funeral director who is a good friend of the family said, we should try going on line and I came across your web site. I purchased the 3003 Mahogany Veneer Casket. I was not off the phone two minutes and my phone rang and a representative from Best Price Caskets was calling me back confirming our order and telling us they were sorry for our loss. I was shocked that someone would take the time to call me back and not just to confirm the order but to see if there was any else we needed and if there was anything they could do. The casket showed up at the funeral home and the funeral director was amazed how beautiful the casket was. When I told him I paid less then $1,000.00 and free shipping he said, there was no way he could of gotten the least expensive casket at that price. Thank you so much for making Best Prce for making our experience a little easier. I checked the funeral homes and I checked other online sites. I checked with my nephew, who is a Funeral Director, and would have gotten me a casket for cost. Best Price Caskets gave me the best price for the military casket I wanted for my husband. My nephew could not even find the casket I wanted anywhere else. I did have to pay to have it flown to GA from Dallas, TX, but it was a reasonable fee. I did get nervous about getting the casket and getting it in time, since I ordered the casket on a Friday morning and the service was on Monday with viewing on Sunday; but the casket arrived by noon on Saturday which was in plenty of time. I am very pleased with the kind, considerate treatment I received, especially AFTER the casket was paid for. As I said I got very nervous and call a few times concerning delivery, but they were always nice and helpful. Best Price Caskets is the most ideal place to purchase a casket when you are on a budget. I first went to the funeral home to receive my quote and was told I would have to pay $3000 for a simple steel casket. After doing some brief research, I stumbled across this website and encoutered the same casket that I saw at the funeral home for $949. I was amazed by how fast the casket arrived, and would recommend this site to all of my friends and family. You can really save big!